Magnolia can live more than 100 years. 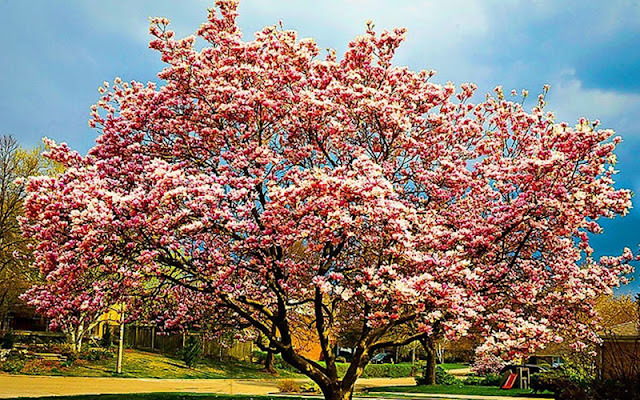 Magnolia is beautiful flowering plant that belongs to the family Magnoliaceae. Magnolias are ancient plants. They exist on the planet at least 95 million years. Since they appeared before bees, magnolias slowly changed their flowers to become more attractive to bees (to ensure successful pollination). It is named after French botanist Pierre Magnol. There are around 210 species of magnolia that differ in size, shape, color of the flower and type of habitat. Magnolias can be evergreen or deciduous. Bark and flowers of magnolia are used in traditional Asian medicine. Leaves of magnolia are used for wrapping of food in Asia. Magnolia is an ancient genus. Appearing before bees did, the flowers are theorized to have evolved to encourage pollination by beetles. The natural range of Magnolia species is a disjunct distribution (two or more groups that are related but widely separated from each other geographically), with a main center in east and southeast Asia and a secondary center in eastern North America, Central America, the West Indies, and some species in South America. They have been naturalized to almost all continents in the world because of their beauty. Bees are main pollinators of magnolia. Size of magnolia tree depends on the species. Smaller species are only 4.5 meters (15 feet) tall. Larger species can grow 25 meters (80 feet) tall and 12 meters (40 feet) wide. Magnolia blooms from April to June. First flowers develop seven years after planting. Magnolia has dark green, oval shaped leaves that are covered with layer of wax. They are alternately arranged on the branches. Leaves have leathery texture and entire margin. Flower of magnolia has pleasant scent that resembles the smell of tropical fruit. Magnolia has grey to brown bark that is smooth when the plant is young. As the plant gets older, bark turns from smooth into scaly. Wood of magnolia is used for the production of pallets and furniture. Magnolia produces 1 ½ to 3 inches wide flower that consists of up to 18 leathery tepals (fused petals and sepals). Flower contains both male and female reproductive organs (monoecious plant). Magnolia flowers come in a variety of shapes, sizes and colors depending on variety. The size of magnolia flowers varies from 7.5 centimeters (3 inches) up to 30 centimeters (12 inches) across and consists of up to 18 leathery sepals and petals fused together called tepals. Magnolia has brown or grey bark that is smooth when the plant is young. As the plant gets older, bark turns from smooth into scaly. Color of the flower depends on the species and it can be white, yellow, pinkish, purple and green. Color of the flower depends on the species and it can be pink, white, red, purple or yellow. The magnolia flower has a strong, pleasant fragrance, usually smell like they have a small hint of lemon or citrus like aroma. Magnolias bloom during the spring season. In deciduous magnolia species flowers appearing with or before leaves. Magnolia has dark green, oval shaped leaves that are covered with layer of wax. Leaves are evergreen and they are alternately arranged on the branches. Leaves have leathery texture and entire margin. Magnolia flowers are protogynous, which means that the flowers first open with the female parts of the flower receptive, then close, and reopen with the male parts (stamens) ready to shed pollen. This evolutionary adaptation increases the likelihood of cross-pollination rather than selfpollination, thus widening the gene pool. Magnolia flowers are typically pollinated by beetles. Magnolias flowers do not produce nectar but they do produce large quantities of pollen. The pollen is high in protein and the beetles use it for food. There are many different types of beetles that pollinate the various species of magnolias. Magnolia produces cone-like fruits coming in reddish-brown; they contain red seeds in the shape of kidney. The seeds mature in the mid-end of the autumn and they are favorite food of many birds. Size of magnolia tree depends on the species. Smaller species are only 15 feet tall. Larger species can grow 80 feet in height. Magnolia has pyramidal crown that can reach 30 to 50 feet in diameter. The life expectancy varies among magnolia species. Most have been known to survive for 100 years or longer. The bark, and flower buds, of magnolia from Magnolia officinalis has long been used in traditional Chinese medicine.They have demonstrated anti-anxiety and anti-angiogenic properties. Fossilised specimens of M. acuminata have been found dating to 20 million years ago, and of plants identifiably belonging to the magnolia family date to 95 million years ago. Magnolia produces cone-like brownish fruit that can reach 2 to 10 inches in length. Kidney-shaped seed can be red, orange or pink in color. Seed of magnolia is favorite food of many birds. The magnolia is the official state flower of both Mississippi and Louisiana. Mississippi’s nickname is the “Magnolia State.” Houston is often called “The Magnolia City” due to the numerous magnolias that grow along Buffalo Bayou. Paul Thomas Anderson created a movie titled Magnolia. Magnolia is resistant to most pests and diseases. Some species are prone to fungal infections. Larvae of certain insects eat different parts of magnolia tree.